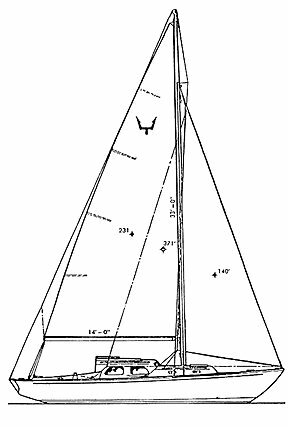 "Design me a 28-footer that sleeps four" was the request, and that's what Marblehead's Carl A. Alberg did. The design became the Triton, the outstanding seller of the 1959 New York Boat Show and the first breakthrough in sales of fiberglass auxiliaries. The terse design request had come from Tom Potter who subsequently joined Clint and Everett Pearson to build the boat. The Pearson Corporation had its Bristol, Rhode Island production line in high gear soon after the show. When asked the why of Triton's sales success, Alberg replied: "She hit the market at the right time - there was no other boat like her available. By using fiberglass, we had much more room inside, about the same as you would find in a wooden 35-footer. The Pearsons built in a very nice interior, one that seemed to satisfy the needs of the average buyer." The Triton came out with sloop or yawl rig options. She was 28'4" overall, 20'6" at the waterline, with a beam of 8'3". She had a moderately long keel that drew 3'11", and displacement of 6,930 pounds. Her auxiliary was a 25-hp Universal Atomic-4. Alberg gave her a wide flare forward for both dryness and working on deck. An owner of a 1963 West Coast Triton in Seattle says, "The Triton was built by both Pearson in Rhode Island and Aeromarine Plastics in Sausalito, California. Very early Pearsons had some problems with balsa core and other minor items. West Coast Tritons were built like battleships." In the early '60's Aeromarine built some 125 boats. They're easily distinguished from their East Coast cousins. East Coast boats have wooden coamings and wooden trim. The California built boats are all plastic. Ralph Beauregard, long time owner and racer of #150, Rascal II, claims, "West coast boats are built better than East Coast. The Sausalito bunch were much better boat builders than Pearson ever was. West Coast boats have no balsa in the decks. None. They're pure glass." Maybe because they were built for the windier conditions of San Francisco Bay, the West Coast Triton's also tend to be heavier. The published waterline of the Triton is 20'6". However, the racing rules of the San Francisco fleet allows waterlines up to 21'6". (Bob Potter, the supervisor at Aeromarine in Sausalito told Beauregard that two early boats were made with more ballast, Grumpy and 92 (Windswept). They had 21'6" waterlines which is why that's in the rules.) 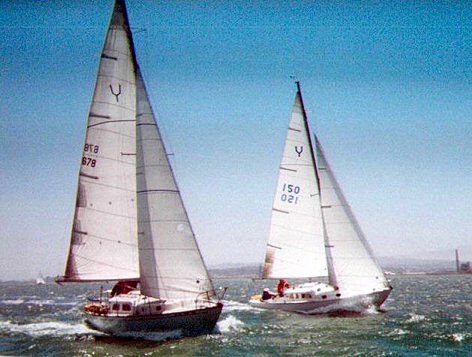 Ely Gilliam, who sails the East Coast Triton Bolero on San Francisco Bay says, "The East Coast boats sail much more like dinghys. They're very responsive. A West Coast boat, like Hulakai, tracks very well in a blow, but doesn't have the lightness in the helm you find in an East Coast version". In races on San Francisco Bay you typically see the two East Coast boats heeling quite a bit more than the others. The Triton's surprisingly quick for her short waterline which, when the boat is heeled, lengthens nicely. The boat heels rapidly to about 15 degrees, then stiffens satisfyingly. It's tough to push the rail under, though it can and has been done often. Water still won't enter the cockpit... you can carry on overcanvassed without stalling the rudder... And it tracks well. Consequently, the Triton is a very forgiving boat, especially for the beginner. "Today you can by a Triton for around $10,000, which makes her a real bargain. We feel fairly confident in saying that it is the smallest, most affordable offshore boat you can buy. At least one has circumnavigated, Jim Baldwin in Atom. And many others have made safe transoceanic passages to Bermuda, Europe and Hawaii. Given the strength of the hull, the devotion of owners, and active owner's association with active racing and rendezvous in most parts of the country, we fully expect to see the Triton well into the next century. I think the Triton attracts so much attention not only because of her sleek, low-slung classic lines, but also because of the fractional, jumper-stayed rig. It is a combination that really makes the Triton stand out in any grouping of boats; it is a unique design that possesses many details that you can't put your finger on, but she just looks right. It is amazing the attention they attract, and everyone you meet seems already aware of the Triton's qualities and probably has a Triton story or two to tell. It is a rare sailor indeed who doesn't appreciate the Triton." "In a sea of beamy, high-topsided, lacking-character boats, the Triton is a gem."